The great teacher Gautama Buddha lived and preached in India over two thousand six hundred years ago. In the fifth century BCE Gautama Buddha walked by the banks of the Ganga River along the dusty paths of the kingdom of Magadha in present day Bihar he was in search of the meaning of life. He called himself a teacher who was seeking the causes of sorrow or dukkha and trying to discover a way we can face it. The Buddha meditated on all the great questions of life – why we suffer pain and disease; why is our life so full of sorrow; why are we born and why do we die. Finally he spoke of the ways in which we can learn to transcend this sorrow and learn to live with love, compassion and joy. His wise words have brought solace to millions through the centuries and it remains relevant even today.The power of his simple, practical teachings have travelled across countries and made Buddhism a world religion with millions of followers. Buddhism is a subtle and perceptive philosophy that teaches a way of life that is based on human qualities of kindness, generosity and morality. What is so unusual is that unlike most philosophers of the time the Buddha was seeking an answer through logical reasoning and not through religious rituals or the worship of deities. Also one of the reasons for the popularity of his teachings was that everyone was welcome in the Buddhist Sangha as he believed in equality and denied the caste system. The Buddha taught of the Four Noble Truths that explain the cause of sorrow which comes from desire. Then he offered his Middle Way or the Eight Fold Path that guided us to the path to a moral life. It was a way of life that can teach us to move beyond sorrow to a life of calm and peace. He called his philosophy Dhamma. The Buddha laid the foundation of a monastic order that he called Sangha and established monasteries where monks stayed and meditated and worked for the welfare of people. In the scripture called Vinaya Pitaka he laid down very precise rules for the life and purpose of the monks. The monks lived a life of scholarship, meditation and as teachers their purpose in life was to help people. They lived very simple, austere lives, begging for their daily food and had no possessions beyond the basics for their daily needs. Over the centuries many schools of Buddhist thought began with great teachers and monks and among them the three most important schools are – Theravada, Mahayana and Vajrayana. In Sikkim, where Buddhism only arrived in the seventeenth century, from Tibet, all the monasteries belong to Vajrayana School, or the Thunderbolt Vehicle. At times called the Diamond vehicle, Vajrayayana Buddhism is also practised in Ladakh and Bhutan. The oldest and most orthodox Buddhist order is the Theravada school and it is practiced in countries like Sri Lanka and Thailand. It follows strictly the teachings of the Buddha that is based on the oldest Buddhist scriptures called Tripitaka. This consists of three books the Vinaya Pitaka, the Sutta Pitaka and the Abhidhamma Pitaka. These scriptures collected the teachings of Gautama Buddha soon after his nirvana from the memories and records of his disciples. In the beginning the teachings were not written down but they were memorised and recited by teachers to disciples. Then in later centuries they were written down in the ancient Pali language. The Buddha always said that he was a mortal and he never claimed to be divine or to possess magical powers. As a matter of fact he opposed the worship of gods, the caste system or performing meaningless religious rituals. What is even more interesting is that he remained enigmatically silent about the existence of any supreme being. He was concerned with our lives on earth and for that he said we have to strive to live an ethical and generous life. The Buddha was a practical and deeply compassionate philosopher who was interested in making our lives better. So in Theravada the Buddha is considered to be a great teacher and a great man and it is his teachings that are given prominence. Initially even his image was not worshipped but symbols of his teachings like the Bodhi tree, his feet and stupas that held his ashes like the one at Sanchi in Madhya Pradesh. Later a new school of Buddhist thought rose in India that came to be called Mahayana. This school wanted to make the faith popular and was influenced by the religious practices of Hindus and began the worship images of the Buddha. Now temples called chaityas were built where images of the Buddha were placed on an altar and devotees prayed and performed religious rituals with lamps, flowers and incense before the image. It was the Mahayana philosophy that would travel to China, Japan and Korea where it would develop in many different ways like the Zen school in Japan. By the early centuries of the first millennium Indian Buddhists in India had become followers of the Mahayana school and for a while it was the most popular religion in India with monasteries across the subcontinent from Kashmir to Kanchipuram. Then by the eighth century there was a revival of Hinduism followed by the arrival of Islam in the twelfth century and Buddhism lost its popularity and was gradually forgotten in India. It would return to the country only in the twentieth century with the revival of the Sarnath monastery by the Mahabodhi Society. The third school of Buddhism is called Vajrayana or the Thunderbolt vehicle. This philosophy was developed over a thousand years after the death of the Buddha, in the eighth century. It began in the monasteries of eastern India like Vikramshila and Nalanda and it was greatly influenced by the mystic and occult practices of Tantra. The Hindu Tantric school worships Shiva and Shakti and these Hindu deities and esoteric rituals also entered the Vajrayana religious practices. Vajrayana is very different from the simple teachings of the Buddha and its rituals include the chanting of mysterious mantras, mudras, mandalas, complex rituals and even the worship of a pantheon of gods and goddesses called Bodhisattvas like Manjusri, Amitabha and Padmapani. There are four main orders of Vajrayana Buddhism – Nyingma which is the oldest and said to be founded by Padmasambhava or Guru Rinpoche, Sakya, Kagyu that is headed by the Karmapa and Gelug that is headed by the Dalai Lama. The monks of the Vajrayana School travelled from Bengal and Bihar to Tibet in the eighth century and introduced Buddhism there. The first teacher was Padmasambava who was given the title of Guru Rinpoche and he is worshipped by Buddhist in Tibet, Bhutan, Ladakh and Sikkim as a god. Padmasambhava is so revered he is also referred to as the second Buddha. Later another Indian monk Atisa Dipankara also spread the religion in Tibet. Very little is known about Padmasambhava except that he arrived in Tibet in the eighth century during the reign of King Trisong Detsen and the king was converted to the Buddhist faith. The life of the Buddhist master is full of many legends and stories of magic and miracles. Padmasambhava means ‘lotus born’ so he is always portrayed sitting on a lotus. He is also referred to as Guru Rinpoche, Vajra Guru and Guru Padma Siddhi. When praying to Padmasambhava devotees chant the mantra, ‘Om Ah Hum Vajra Guru Padma Siddhi Hum’. As Tibet became Buddhist a huge programme was initiated by the kings to translate sacred Buddhist texts in Sanskrit into Tibetan. By the twelfth century Buddhism had vanished from India, famous libraries like those at Nalanda University had been destroyed by Muslim invaders and these precious Buddhist manuscripts were believed to be lost. Then in the nineteenth century British scholars of the Asiatic Society discovered them in Tibetan and Sri Lankan monasteries and the teachings of the Buddha were once again revived in India. Today the most famous head of the Vajrayana order is the Dalai Lama who lives in exile in India. Other religious leaders from Tibet are the Panchen Lama and the Karmapa. 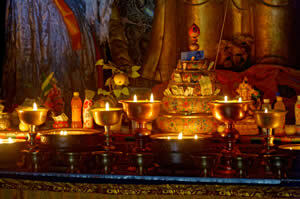 From Tibet the religion reached Sikkim much later in the seventeenth century with the arrival of three Tibetan monks. In the seventeenth century, three Tibetan lamas Lhatsun Chenpo, Karthok Rikzin Chenpo and Ngadak Sempa Chenpo arrived in Sikkim from three different directions and met at Norbugang Yuksom. They decided to establish a Buddhist monastery in the state. In 1642 they crowned Phuntsog Namgyal as the first monarch of Sikkim and gave him the title of Chogyal, or Dharma Raja. The Chogyal worked to establish a Buddhist kingdom as the three monks worked to set up monasteries all across Sikkim. The first monasteries were built at Dubdi and Sanga Choling in west Sikkim. As the faith became popular through its royal patronage soon many villages had their own monastery. 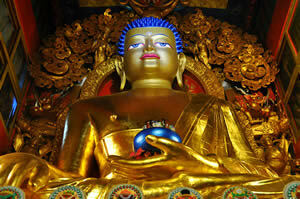 Today Sikkim has over 200 monasteries and the Buddhist faith is an important part of the life of the people.